As a committee, we were immensely proud of our Hamilton conference in 2014. We had some fantastic science, some very informative presentations and some animated debate. This made it not only educational but wonderfully entertaining as well. Keeping that momentum up, it is our intention to replicate this in Rotorua in 2015. Our conference host team is led by Jacqui Mackle who was recipient of two awards at our 2014 conference and is also the forum treasurer. Rotorua is probably best known for being a tourist mecca with a large number of hospitality type businesses. The size of this industry in Rotorua presents some unique challenges for the city. Despite the image of being a tourist centre, the Bay of Plenty has significant industry which has nothing to do with tourism. I am sure that in our field trip we will get to see some of this industry. Our theme for this year is “Cooperative planning of infrastructure to meet future demand”. This probably sounds a bit cliché but moving around the country, I am constantly receiving complaints from industries that feel stifled by available infrastructure in their local area and utility providers complaining about industries overloading their systems and the restrictions of the consents issued by the regulatory bodies. Right from its conception, it has been one of the stated aims of the Forum to getting Resource Users, Utility Providers, Regulatory organisations and Service Providers around the same table to discuss the issues. If we are successful in establishing this dialogue between these various groups then the next logical step is to get this group to start planning where it is going. If the industries know what their needs are now and are likely to be in the future, communicating this to the local Territorial Authority will enable planning of infrastructure improvements. If the territorial authority know what their likely infrastructure needs are then discussions with Regulatory organisations can start long before it is required to ensure a smooth transition to additional resource allocations. It sounds so simple, sadly with few exceptions, this is a process that is not occurring within New Zealand and all indications are that without some help, this situation isn’t going to change so come and join us for our 2015 conference and be part of the movement to facilitate this change. 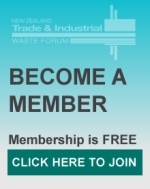 Join in the conversation by following the New Zealand Trade and Industrial Waste Forum on Linkedin.